Description: The debut full-length from 21-year-old San Diego resident William Snavely is packed with the best kind of gnawing, chromatic electronic music championed by the labels listed below. You know -- cracked-out cyborg chipmunks-frolicking-in-the-moonlight kinda stuff. Though it's likely you're familiar with this particular style of music, Diagram is a bit mellower than your standard cut-and-paste craziness. It's also worth checking out other similar artists on the label. 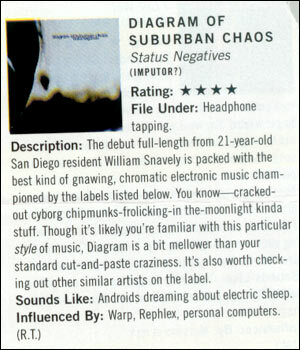 Sounds Like: Androids dreaming about electric sheep. Influenced By: Warp, Rephlex, personal computers.